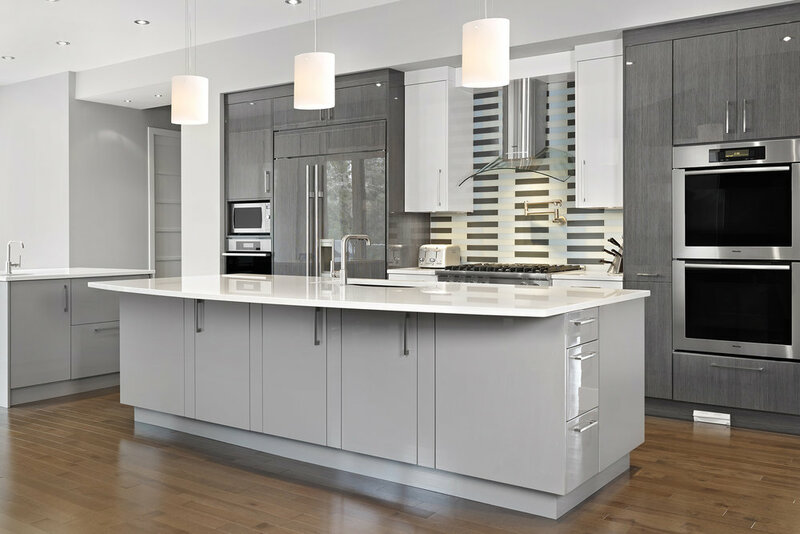 The use of stainless appliances and light neutral colored countertops contrast the dark tones found in the cabinets achieving this modern look. This premium project features a fusion of several elements: the cabinetry combination of wood grains and solids in glossy and silk finishes provide the perfect balance of visual interest. The kitchen also features geometric patterned glass tiles, integrated touch lighting and integrated professional appliances for a sleek seamless look. It is with no doubt a chef’s delight. The horizontal, suspended vanity and custom mirrored cabinets are unique features in the master bathroom adding storage without adding visual bulk. The pot filler and backsplash tile behind the cooktop as well as the hood vent creates visual interest that draws you into the space.